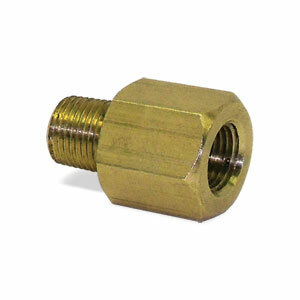 This 1/8 NPT snubber is made specifically for Cummins 5.9L diesel engines and dampens the violent fuel pressure spikes. It is highly recommend that you use this snubber on trucks with the VP-44 injection pump to dampen the fuel pulsations (hydraulic hammering) created by the injection pump. Its a good idea to install a snubber for the fuel pressure sending unit when running an aftermarket high flow lift pump. This works very well to stabilize fuel pressure indication fluctuations and is easy to install. "Geno's Garage is the reason my truck is on the road. No one else had this part. Geno's did! Ordered it on a Friday at 9 p.m., got it Tuesday morning. Mind you, this was Christmas weekend. Excellent customer service. Prompt responses. Very happy (and now loyal) customer. Will be recommending Geno's Garage to all my Dodge-addict friends. (Let's be real, they're the only friends worth having anyway)! Will be spending my hard earned money here again! Especially with their great prices! P.S. - Thanks for the free calendar!"